You know when an inanimate object just feels right? Well, so it was when I first took out what is now my very own stand-up paddleboard. I’d been heading towards getting a board — yup, seemed to have got irrevocably sucked into this now! — but before I committed to the one I thought I wanted, it seemed like a good plan to try a few more. So Bray Lake chief SUP coach Scott Warren left out three boards for me to test paddle one evening before he went home. One I’d sampled before and hadn’t much liked, but I wanted to double-check. The second was something similar to the one I had my sights on, just a different brand. Up to that point, my SUPing had all been on inflatable boards, which offer numerous advantages. Not least of these is the most obvious: they can be deflated, packed in a bag, and stuck in the back of the car. They’re also light, pretty tough, forgiving, and fun, and I was all set to go this route. Then I launched Scott’s final and frankly inspired selection and within a couple of minutes I knew this was the one for me. It’s a carbon board, and it is a truly a game-changer because it really does feel completely right. Hard boards behave differently from inflatables in the water anyway, but there’s just something about how this 2015 Starboard Race moves and responds that makes it absolutely perfect for me at this point in my SUPing journey. So what do you do when you get something new? 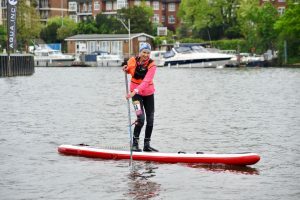 You put it through its paces of course, and Sunday 6 May saw me setting off with two fellow Bray Lake paddlers to Cardiff for the day for the second in the GB SUP 2018 national race series. Now you may recall that my first race beyond the familiar waters of Bray did not go brilliantly well but I’d already laid that ghost the week before Cardiff when I crossed the Battle of the Thames finish line on 28 April with — as I’d promised myself I would — a big smile on my face. It was my birthday that chilly, grey London day, and I honestly can’t think of a better way to celebrate another fine year on the planet than paddling 10 miles (16k or so) on the Thames! Yes, it was hard work and it’s a course that could easily mess with your head as you pass the finish line several times before actually crossing it, but I went into this event with much lower expectations and that paid off in spades. Birthday smile: Preparing to turn around after finishing the Battle of the Thames on 28 April 2018. Not that BoTT was without a few mishaps — my hydration pack first stopped working and then started leaking within the first few kilometres, and I fell in less than halfway round — but I really did keep on smiling and enjoying the experience. 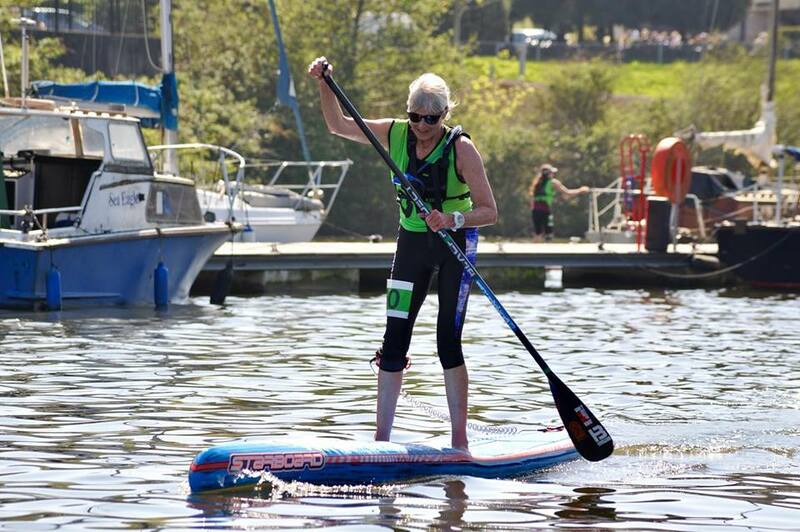 I finished last in the 12”6” women’s race but was nonetheless rewarded with recognition as second Grand Kahuna in my race class, the GP SUP series label for those of us over-60. My wonderful role model Susan Jones got there first, by some margin. So I came away from the Thames with a little bit of bling, delighted to have finished under three hours — that had been my goal — and ready for my next adventure at Cardiff International White Water. Only now it was my 12’6” Starboard Race making the journey to Wales, not the Red Race inflatable I’d been training on for months and had cut my SUP racing teeth on. Nothing whatever wrong with the Red board — I’d enjoyed (nearly!) every minute on it and had Scott not had his moment of genius, that’s what I’d have bought. But here I was heading west on the M4 on a cloudless blue sky day, and I couldn’t wait to see what difference the Starboard would make on this 10k course. The answer? A big difference. I was consistently faster as the board elegantly navigated the chop through Cardiff Bay without tipping me off and moved smoothly through the calmer waters of the river Taff. 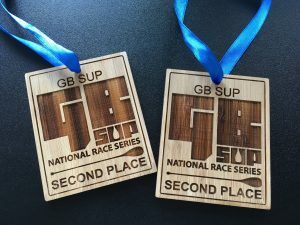 Bling time: Second-placed Grand Kahuna (over-60) at the first and second GB SUP 2018 National series 12’6″ women’s races. And this time not only did I pick up more bling as second Grand Kahuna, I didn’t come in last in my class! If I’d finished BoTT with a smile, this one I finished with a euphoric grin, delighted to have broken 90 minutes on a pretty challenging out-and-back course on what was an absolute scorcher of a day. For context, I crossed the line in Cardiff more than 20 minutes faster than I had over much the same distance in Devon three weeks earlier. This feels like a significant milestone on what’s already been a pretty amazing SUP journey and I can’t wait to see what lies ahead. Really great account of an awesome achievement so far. We look forward to seeing you on many more startlines very soon!